The 32nd annual Tour of the Gila began Wednesday with the return of the hill top finish on Mogollon. Canel’s Specialized Oscar Sanchez shattered the breakaway with a strong solo attack in the final kilometers that only Rob Britton (Rally Cycling) who finished second, could follow. A surprise finish for third place by Alex Evans (Mobius Bridgewaylane) rounded the podium. The day began with Canel’s Ignacio “Nacho” Prado bursting out of the field shortly after the paddled dropped at kilometer zero. Prado quickly gained a minute lead, that would soon balloon into 5 minutes. The National Time Trial Champion of Mexico settled into a solo break that would last over 60 miles of the stage before getting caught. A two-man chase group including Michael Hernandez (Aevolo) and Carlos Brenes (Costa Rican) chased for most of the day, by the time they caught Prado, team orders forced them to sit up and return to the field. Returning champs, Rally Cycling, were left to drive the peloton, helping to set up Britton for the finishing climb. Sanchez heads into Stage 2 holding the leaders jersey, as well as the KOM jersey. After scoring top points in both bonus sprints of the day, Prado will wear the sprinter classification jersey. Evans holds the lead for Best Young Rider. Shortly before the men’s finish, Katie Hall (UnitedHealthcare) continued her winning streak at Joe Martin, by winning atop Mogollon for stage 1. Sara Poidiven (Rally Cycling) finishing 8 seconds behind. Edwige Pitel of QCW Cycling finished third. The race saw calm winds for the first time in years for stage 1, which helped keep the field together for the majority of the day. UnitedHealthcare Pro Cycling and Rally Cycling took over once the race made the last turn heading into the climb for the finish. Poidevin now leads the Best Young Rider classification, happy to return to the Gila after missing last year’s edition due to injury. Katie Hall is in red for stage 2 and leading the Queen of the Mountain classification. Erika Varela (Team Conade-Specialized) will wear the green SkyWest Media Sprinters jersey. 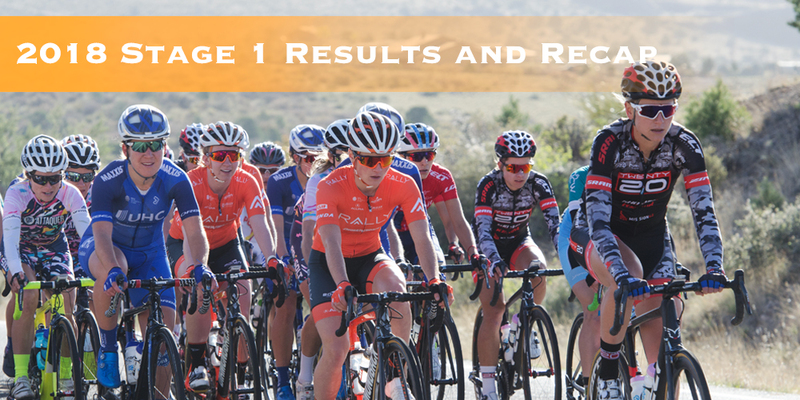 Stage 2: Inner Loop Road Race p/b Brian & Lynn Robinson along with the Southwest Bone & Joint Institute will begin and end in Ft. Bayard with the men at 9:00 AM, and the women at 10:40 AM MDT. Article contributor Rebecca Reza. Thanks to Grant County and all the workers who made sure every detail was great. Thanks for the last minute road sweep to Mogollon and all the other road preparation and safety you provided. Grant County offers an amazing place to hold professional business meetings and conferences. Check out the Convention Center for your next retreat or convention.